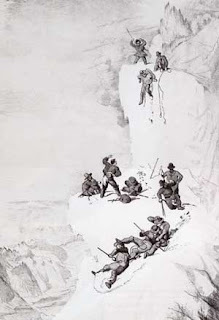 Three days before Christmas, 1857, a group of British mountaineers met at Ashley's Hotel in London and formed the Alpine Club, the world's first association of climbers, which is still going strong [shown above: climbers on Mont Blanc]. 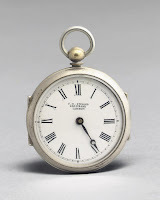 To mark the club's 150th anniversary, Christie's (King's Street, London) is holding a landmark sale called "Exploration and Travel: The Alps to Everest," which features, among many other things, a fascinating collection of items from the Victorian period. 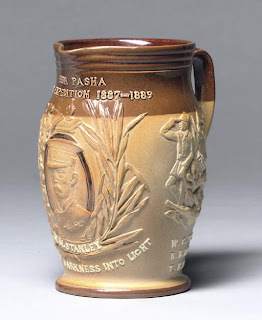 Among the lots on offer: letters by David Livingstone, including one calling Richard Burton "an awful ruffian"; Henry Morton Stanley's pedometer [shown here] and gold watch; an album containing 91 photographs of Stanley's lecture tour of the United States in 1890-91; a Doulton brown-ground glazed pottery jug commemorating the Emin Pasha Relief Expedition of 1887-89 [shown below]; the manuscript journal of a sailor who took part in an arctic expedition under Captain George Strong Nares in 1875-76; letters by Robert Falcon Scott, Ernest Henry Shackleton, and General Charles George Gordon; books, paintings, prints, and maps galore, plus telescopes, skis, binoculars, and other equipment used by those who braved the antipodes. The sale includes several albums of views of India and its people by renowned photographers Bourne, Shepherd, Paar, and Herzog & Higgins. 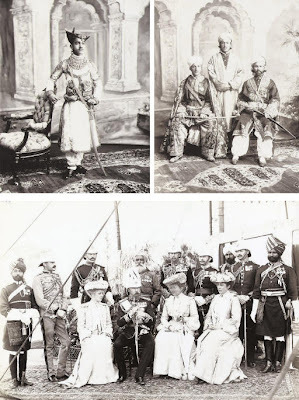 One of these contains 112 photographs of the Coronation Durbar of 1903 [shown below]; another commemorates the visit of the Prince of Wales to Gwalior in 1906. The historical importance of many of these items is staggering and I hope they will find their way into archives that can preserve them properly.